Why was Tuesday's traffic jam on the Colwood Crawl so bad? West Shore commuters are no strangers to stop-and-go traffic on the stretch of the Trans-Canada Highway leading into Victoria. But according to those drivers, a Tuesday morning traffic jam on the infamous "Colwood Crawl" was one of the worst in years. Countless commuters were late for work, with some reporting that it took them an hour just to get from Langford to Uptown. "Half an hour, we sat there. I actually had to put my car in park because I got tired of having it on the brake," said driver Leeanne, who has lived in Langford for four years. "I've never seen traffic like this, ever." While some drivers gave up in frustration to attempt the route later, others just accepted their trip would take twice as long as usual. Many blamed it on highway congestion near the McKenzie Interchange, which is still being constructed. B.C. 's transportation ministry later confirmed that the slowdown is due in part to a traffic pattern adjustment made at the intersection last week. Southbound lanes of the highway at McKenzie were realigned, shifting traffic to the right and causing extra congestion. "Roughly 85,000 trips are made along this corridor every day, and whenever there is a major realignment such as the one experienced last week, initial delays can be expected," the ministry said in a statement. 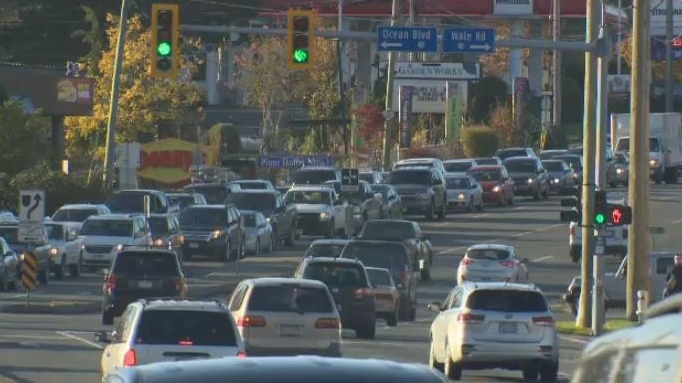 The ministry said it will continue to monitor the Colwood Crawl situation and may make adjustments to reduce further delays, including to traffic lights.